The UUP have said they will “move quickly” to formulate a decision on whether they should back the UK’s continued membership of the EU. 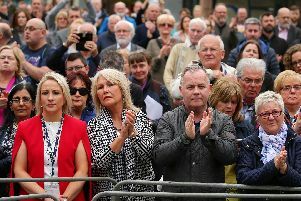 In a statement a spokesman for the UUP said: “The Party Executive discussed the question of the UK’s continued membership of the EU at its meeting on Thursday and agreed to return to the matter once the details of any deal were known. Prime Minister David Cameron announced the referendum date of 23 June after briefing his Cabinet on his recently secured reform deal that gives the UK a special status within the European Union. He confirmed that the Cabinet had backed his plan but individual ministers have since join different camps. Today Secretary of State for Northern Ireland, Theresa Villiers, said she will vote to leave the EU “to take back control over our country and making our laws and controlling our borders”. Theresa Villiers said there were “risks on both sides of this debate” but the “safer option” was to leave. Ms Villiers said the UK could then “negotiate a new deal based on free trade and co-operation”. Meanwhile the DUP formally announced its intention to campaign for a Brexit on Saturday. The other three parties in the Executive, Sinn Féin, SDLP, the Alliance party all support the UK staying within the European Union.